Two weeks ago my oven caught fire so I dialled 999. Within five minutes two fire units arrived and I had a house full of firefighters. I had a lucky escape as no-one was hurt and nothing was damaged. Since then, my mind keeps drifting back to those firefighters … but not for the reasons you may be thinking. Imagine if we injected some of the emergency services’ flexible mindset into organisations that struggle to adapt and evolve, for example, some public sector organisations, education, third sector and retailers. As we know, the emergency services is publicly funded so why is there such a difference between the flexible mindset of firefighters and the inflexible mindset of some publicly funded employees? With this in mind, I asked our local fire station manager, Roy Barraclough, to reveal the secret. How is it that his crew are always ready to adapt so quickly to different scenarios? He advised me that his managers are assessed against a strict programme even before they are permitted to take on the role. They are also signed to leadership courses and real-life computer-based simulation. Firefighters undergo continuous learning and assessment, training and competency programmes covering driving, breathing apparatus, first aid, manual handling and risk management. Now it’s time to apply some 999 learning to business strategy. Are organisations using suitable assessment methods to recruit the right kind of employee that will live by their values? Or maybe some organisations are employing the perfect candidate and then the leadership team strangles employees’ creativity and capabilities with red tape and policies. There are schools with just three rules: “Look after yourself, look after each other and look after the place we are in”. Perhaps we could all learn by this. Strategic tools such as SWOT analysis (Strengths, Weaknesses, Opportunities, Threats) and STEEPLE analysis (Social, Technological, Economical, Environmental, Political, Legal and Ethical) help organisations to use their strengths to overcome weaknesses and threats, in turn creating and exploiting opportunities. If you use these tools, how does your organisation make sense of the information gathered? How has your business embraced the transparency and two-way dialogue that social media has created? What changes would happen in your industry if Britain left the EU? The emergency services’ role is a risky business. However, they have the capabilities and resources to make informed decisions because they continually learn. In business, leaders may have graduated with MBAs in the early days, but how many business owners continuously develop their leadership skills within their own business environment? “Success in the marketplace increasingly depends on learning, yet most people don’t know how to learn” (Argyris, 1991). Did you know that many risk averse organisations fail to learn and adapt to change? On a scale of 0-10, 0 being risk averse and 10 being innovative – where does your organisation sit on the scale? What steps can you take to push your organisation up the scale and create an innovative culture? When was the last time you learned? Did you attend a one or two day training course? Most people we ask have trouble remembering elements of such training courses after just a few weeks; the best way to learn is to ‘do’. The Chartered Institute of Personnel and Development (CIPD) suggests that ‘Coaching can have a very positive impact on individuals for whom traditional learning modes such as classroom teaching has very negative associations. Executive Coaching empowering leaders to learn and develop their skills at a faster rate because coaching is ‘doing’. Charles Handy is an organisational behaviour and management expert and author. In his book, The Age of Unreason, he said: “If you put a frog in water and slowly heat it, the frog will eventually let itself be boiled to death. We, too, will not survive if we don’t respond to the radical way in which the world is changing.” This analogy indicates that businesses need to keep adapting even if changes appear to be minimal. Deloitte has published a document called Resourceful Leadership: Leading for Outcomes in a Time of Shock. The publication suggests leaders must be resourceful and adopt eight core behaviours to be able to adapt in times of change. These behaviours include being open, being able to collaborate, believing in their team, being able to create and sustain commitment from team, having an ability to learn and demonstrating focus. Executive coaching helps leaders to develop these behaviours. Don’t be that boiled frog. 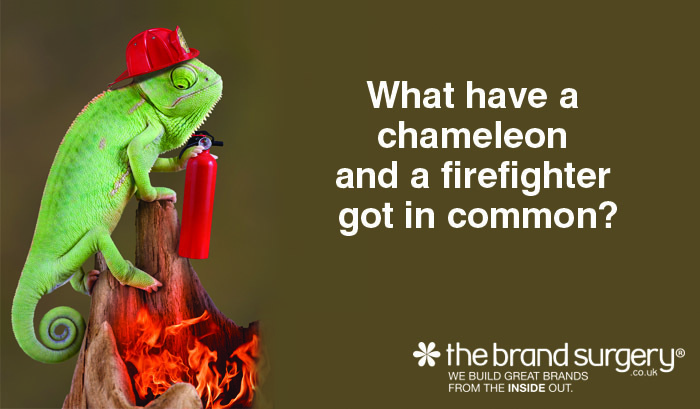 Organisations that continually learn, develop and implement the mindset of the emergency services will have the ability to adapt and be ready to embrace both tiny or extreme changes; just like a chameleon can change its colour and firefighters are ready for anything. One way of achieving this is by developing your leadership skills, allowing you to empower your team to become a super-strong brand. Executive coaching will help you to develop effective leadership styles so you are able to deal with all types of situations. I am offering two organisations a one-hour complimentary executive coaching session. 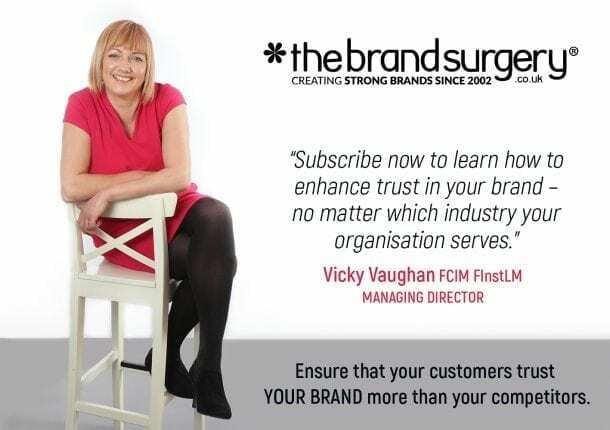 Visit www.thebrandsurgery.co.uk or email vicky@thebrandsurgery.co.uk for further information. The Brand Surgery builds great brands from the INSIDE out.